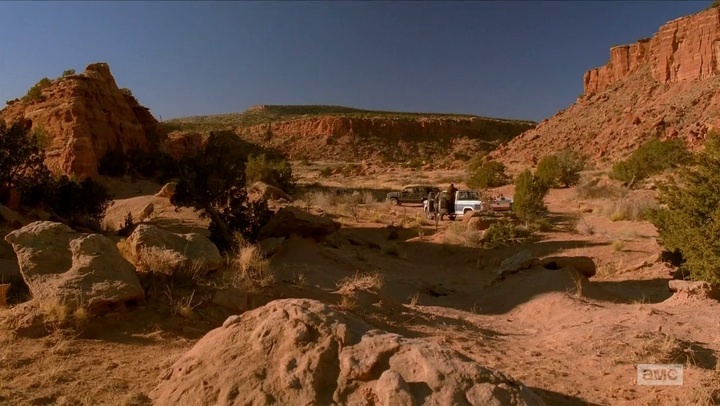 Editor's note: Last year, RogerEbert.com contributor Dave Bunting began editing a series of video essays that arrange images from seasons of "Breaking Bad" in ways that highlight the show's motifs, colors and textures. Bunting published most of his video essays on the series at Press Play, and is finishing the series as a coproduction between that site and RogerEbert.com. Watch his take on Season 1 and read an essay by Nick Schager here. You can also view the video and an accompanying essay by Max Winter at Press Play. You can find his video essay and the transcript of an interview with series cinematographer Michael Slovis about Season 2 here or at Press Play, with an accompanying essay by Arielle Bernstein. Bunting also published videos about Season 3, Season 4, and the first half of Season 5 at Press Play. Bunting's concluding video, about the second half of Season 5, is below, with an essay by Scott Eric Kaufman. You can also watch this video and read a companion essay by Arielle Bernstein at Press Play. The fifth season of "Breaking Bad" is an exercise in aggressive nostalgia. 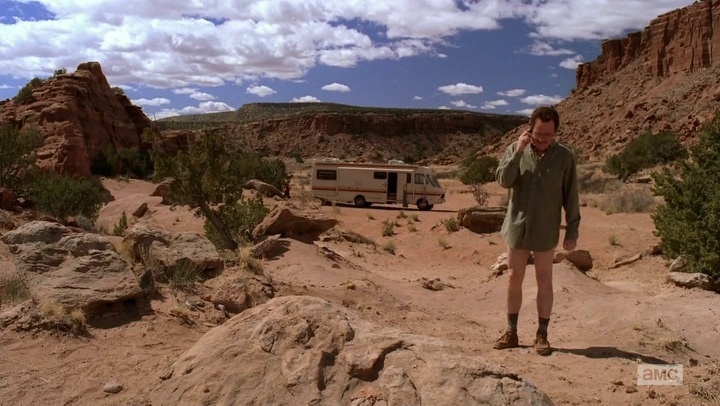 "Ozymandias," lauded by many as one of the strongest hours in television history ten minutes in, is especially committed to reminding the audience how different the world these characters inhabit is. But this is no ordinary flashback. This flashback is holding the narrative hostage. Except he doesn't just linger: as the water reaches a roiling bubble the camera slowly zooms in. 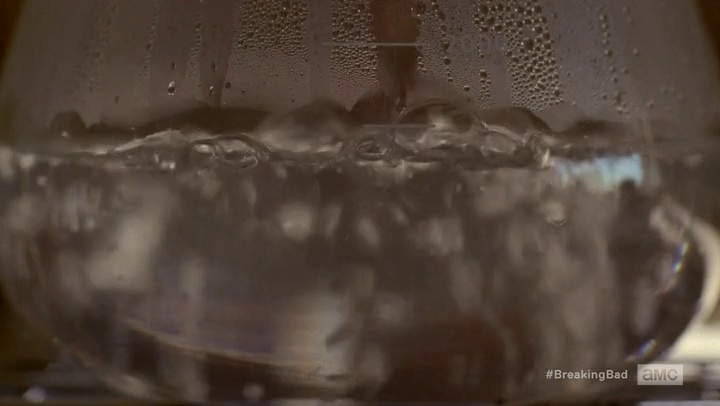 Johnson wants the audience to pay attention to what happens when heat is applied to a quiescent liquid, so he pushes the camera closer, focusing not on the bubbles in the water but on the condensation forming on the side of flask, an effect the heat didn't intend, if it intended anything, but which happened nonetheless. The water is still water, even though its circumstances have changed. It'll still eventually evaporate. Meanwhile, in this very same spot, two good men are about to meet undeserved ends. 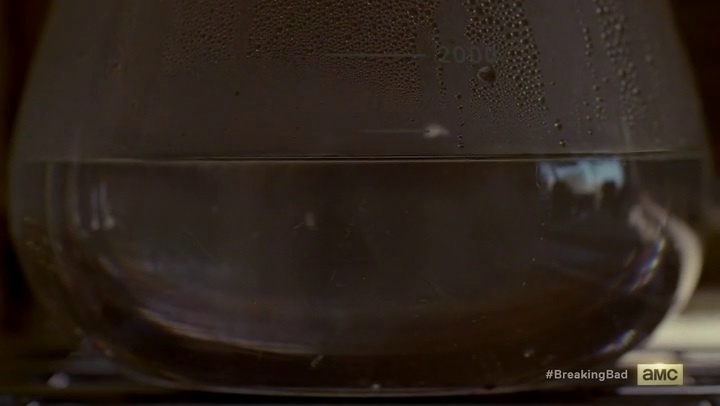 To an audience raised on the instant gratification provided by Netflix—the platform which, more than any other, has helped transform "Breaking Bad" into the phenomenon it is—watching this flask boil is akin to torture. They wanted to hit forward the second "To'hajiilee" ended and learn the fate of Hank and Steve, but Johnson refuses to pander. He presents them with twenty seconds of a flask coming to boil, which given that they have already waited through 59 episodes to reach this point, shouldn't be too much to ask. But just in case it is, Johnson lingers and zooms. It's noteworthy that heat was already being applied before the flask appeared on-screen, and that Johnson quick-stepped through the dull part of the boiling, when no bubbles are visible. The still waters hold, then explode into a crush of bubbles, at which point Johnson begins to move in. In a little under twenty seconds, Johnson recapitulates the entire narrative of a series about a man who, if only a little more heat were applied, would erupt into a boil, which he did. But eventually he'll evaporate too. As they bicker, it seems as if the light is fighting to get in. The scene is brighter than it should be, in part because the one it imitates predates the arrival of Michael Slovis, who wouldn't sign on as director of photography for another year. That may seem like trivia, but Slovis dramatically altered the look of the show, and in this episode, he and Johnson take advantage of that difference to create a strong visual contrast between where the show began and where, as we all now know, it ends. The same patch of land, shot from a nearly identical angle, but literally later in the day. Walter's lies have metasticized to the extent that no one cares what truth he claims they serve. Even the world seems angry. The soft morning light has been replaced by the strong, saturating light of late afternoon, which casts long shadows across the intensified colors of the hills and plains. The sun's threatening to set on the enterprise Walter and Jesse undertook in the unthreatening light of the early morning, and the land that looked like mere background before the credits seems far from sundry now: its color has become a character, capable of judgments, albeit inscrutable ones. This is not to say that a slight shift in the palette or scheduling defines the aesthetic of the final season of one of television's most visually stunning programs, but it is indicative of the general ethos adopted by the talented people who directed these episodes: the day is late for Walter White, and to quote the man who thinks him incomparably evil, the night is long and full of terrors. That these terrors are full and well and long-deserved almost seems beside the point after the finale. 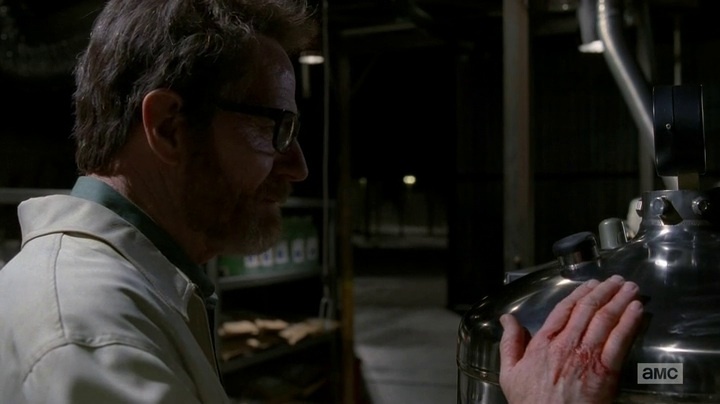 As Walter told Skyler in "Felina," in the end he cooked for himself, because he liked it, because he was good at it, and because, when he knew he was dying, it made him feel "alive." Nowhere is this contradiction more apparent than in the closing moments, when Walter's death is more immediate than abstract. This close-up suggests that Walter is seeing himself as one does in one's children and grandchildren: reflected. As he pats the boiler's "head," he seems unquestionably happy with the life he's about to lose, but the shot itself undermines him. He sees himself reflected in the tools of his work, and feels pride in the process they enable, but the audience sees a distorted image of a man who felt the world owed him, and his genius, more than it ever paid out. That he died happy and deluded is, perhaps, more than he deserved.